August is back-to-school time, and for many families, that means life is about to become chaotic again. Mornings will be bustling, and after-school activities can makes afternoons and evenings just as hectic. Taking some steps in your home now to get organized can help things run more efficiently when school begins. No parent wants to have to run to school to deliver a forgotten backpack, or be frantically searching for shinguards just minutes before soccer practice is supposed to start! Creating a place for family members to drop these items off when they get home makes it easier for kids (and parents) to remember them the next time they head out the door. 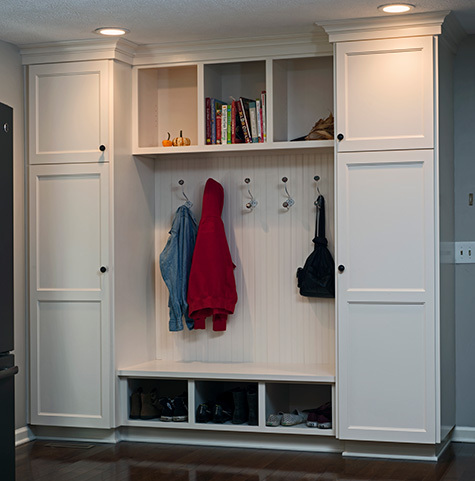 Entry ways, mud rooms, laundry rooms, and even attached garages are great areas for this zone to be located, providing a central home for items such as backpacks, coats, purses, shoes, sports gear, and rain or snow accessories. Clutter can be kept under control by using built-in storage cubbies, coat hooks, storage benches, and shoe organizers so that every item has a place. Families with multiple kids can even designate a special zone for each child using fun labels. Designate space in a lower cabinet, drawer, or pantry shelf for school lunch items. Custom, pullout sections inside cabinets and pantries work great for this purpose. Storage containers, water bottles, lunch boxes, and non-perishable lunch items can be stored in this space for quick and easy access. In the refrigerator, keep lunch items such as deli meat, cheese, yogurt, fruit and veggies, and cold drinks together. Divide food into serving-size portions ahead of time using resealable plastic bags or storage containers. School handbooks, sign up sheets, classroom schedules…the list goes on and on! In the first fews weeks of school, kids tend to bring home a steady stream of paperwork that can quickly consume your kitchen counter or dining room table. To get a grip on the paperwork, choose a central location in your home (preferably not your kitchen counter!) where kids can unload their school papers each day. Having all the paperwork in one place makes it easier for you to sort through. Prevent stacks of paperwork from accumulating by immediately tossing papers you don’t need. Whether it’s for a sport your child just isn’t interested in, or a chaperone signup slip for a field trip you know you won’t be able to attend, don’t let these papers create unnecessary clutter. Urgent. Use for items that need to be reviewed and returned to school ASAP. This would include permission slips, medical forms, school picture forms, sports signups, or volunteer forms. Review. Placing items such as school handbooks, classroom rules, or school-year calendars in this folder lets you sort through the paperwork now and review these items later. Just make sure to check for acknowledgment slips that might need returned to school by a specific date. Out. Use for items that have been reviewed and are ready to go back to school. Reference. Use this folder for things you may need to refer to throughout the school year. Creating a family message station in a high-traffic area of your home, such as your kitchen, can help ensure that everyone in the family sees the messages and is on the same page. Hang a dry erase board for writing notes or lists, or use a bulletin board to pin important information such as invitations. Keep track of school activities, sports schedules, and appointments with a dry erase board calendar. If you’re thinking it might be time to add some custom-built solutions in your home to help your family stay organized, just give us a call. We’d love to help!